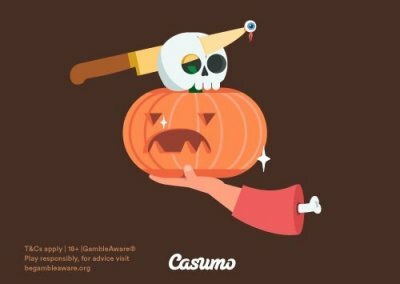 Halloween is in full swing, and at Casumo they are celebrating with spooky bonus spins and Sunday Reel Races on scary looking slots. Sink your fangs into a collection of new and exciting slots, and win big money in the £2000 Reel Races! If you’re new to Casumo’s wildly popular Reel Races, you can read about how they work, as well as their terms and conditions, on the promotion page at Casumo. Join as many as possible, as £1000 are up for grabs in each race! This week’s special Reel Races are hosted on The Planet of the Apes and Mighty Arthur, and you can cash in a nice amount of bonus spins on these exciting slots. All you need to do is login to your account and activate the offers from your inventory. On the 31st of October you can choose your bonus spins amount by making a deposit. Get up to 60 bonus spins on Planet of the Apes! And on the 3rd and 4th of November you can make a deposit to receive 20 bonus spins worth £0.20 each.Note that the bonus spins have a wagering requirement of x30. For full bonus terms, read the terms and conditions at Casumo. Which slots do you want to try out?